Mishaps and Adventures: Diary of a Wimpy Kid. This Fall . . . Everything Changes. Diary of a Wimpy Kid. This Fall . . . Everything Changes. 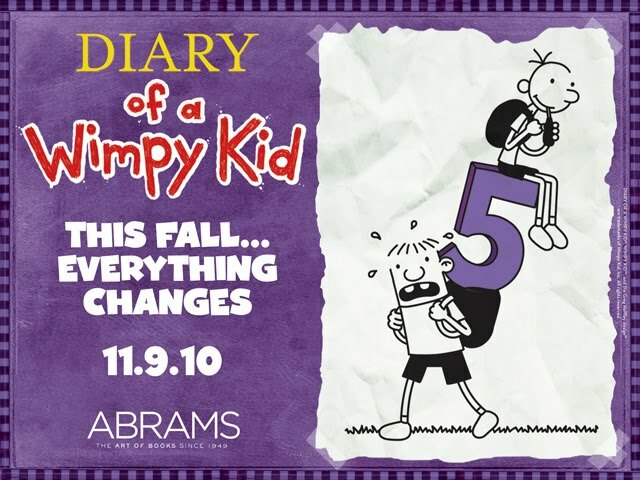 Amulet Books, an imprint of ABRAMS, revealed today that the fifth volume in Jeff Kinney’s bestselling Diary of a Wimpy Kid series will be on sale nationwide Tuesday, November 9th, 2010. The cover will be purple, which follows the red, blue, green, and yellow of the first four installments. Summer and fall promotions leading up to the release will be announced in July with the cover and title of the book. This new book follows the momentum generated by The Wimpy Kid Movie Diary, a nonfiction book with all-new material by Jeff Kinney that, with over 2 million copies in print, has topped the Wall Street Journal’s nonfiction bestseller list since publication. 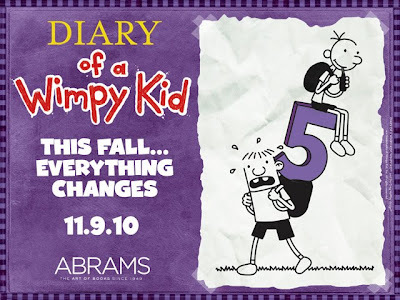 Twentieth Century Fox’s live-action Diary of a Wimpy Kid movie, which debuted in theaters March 19, 2010, generated over $61 million in ticket sales. A second movie is due in theaters March 25, 2011. A 16-month wall calendar with photographs and dialogue direct from the first movie is in stores this summer. I was wondering when this was going to be on your blog!! Can't wait to see the cover. And purple really fits for a wimpy kid. We are running out of colors! What do you think the next color will be?